After having great success with beet hummus, I was inspired to create a more substantial main course salad with the same flavour profile. My opportunity came soon enough with the arrival of wheat berries from my most recent CSA share. I made grated beets and carrots salad in the past but it was more along the lines of French cooking. This time, I brought out all the middle eastern ingredients I have in my pantry. Between the heady flavours of garlic, shallots, cilantro, and cumin tied together with creamy tahini and bright lemon, this salad is bold but definitely echos the familiar taste of hummus. 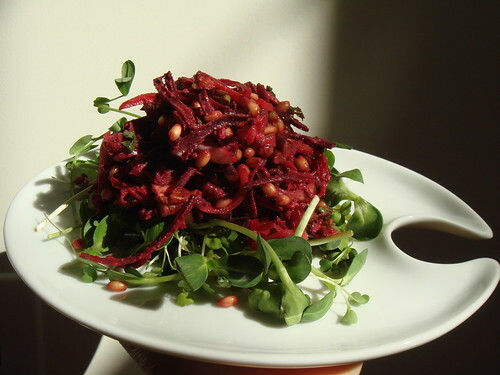 I like the crunch of raw carrots and beets to contrast with the nutty chewy wheat berries. Toasted pistachio would be a great addition for its vibrant green colour and richness. Besides, I think it is a better fit with the middle eastern theme. Unfortunately, I don't have any at home so pecans would have to do. 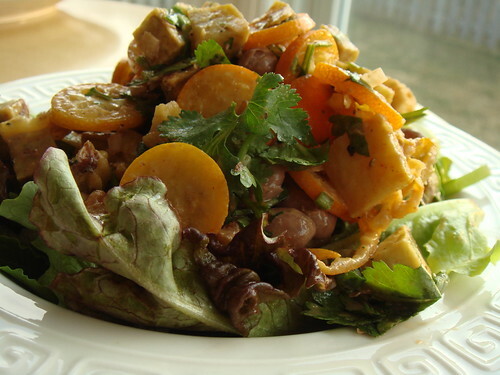 This vegan main course salad is a good potluck dish or bring along for picnics. Nutritional analysis is available here. In a medium pot, bring 8 cups of water to boil. Add in wheat berries and bay leaf and about 4 tsp of sea salt. 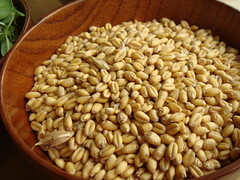 Turn the heat down and simmer for 40-60 minutes until wheat berries are soft but still slightly chewy. Drain and discard bay leaf. Preheat oven to 350F and toast pecans until fragrant, about 7-8 minutes. Cool and roughly chop. Set aside. While the wheat berries are cooking, peel and shred the carrots and beets. If you have a food processor, now is the time to bring it out! In a large mixing bowl, toss together shredded beets, carrots, cilantro, shallots, and pecans. To make the "hummus" dressing, zest and juice both lemons. I like to use the microplane for this. While your microplane is out, use it to grate the garlic cloves too. Stir together all remaining ingredients in a small mixing bowl. Adjust seasoning. Dress salad with the dressing. In fact, I like to do this ahead of time so the flavour has time to meld together in the fridge overnight. I prefer to serve over a bed of sprouts but it is just as tasty by itself. Just before serving, drizzle with additional promegranate molasses (love this stuff!) for some additional punches of sweet and tart if you want. Add a couple wedges of toasted pita, and you have yourself a nice light meal. After waxing poetic on duck eggs yesterday, of course you know that I'll have more recipe ideas coming. I'm not even sure I can legitimately call this a recipe because it is one of the simplest meal you can make. 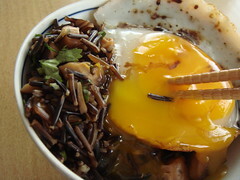 Fried egg over a steaming bowl of rice, that is as basic as you can get for homestyle Chinese cooking. 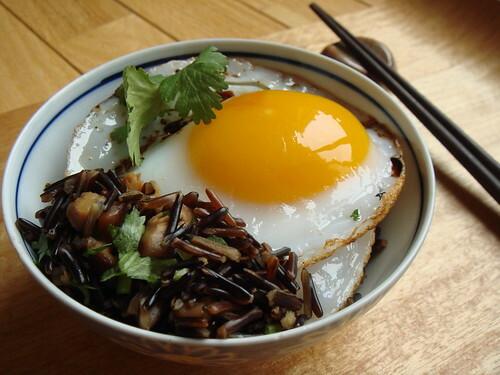 A splash of soy sauce and a splash of roasted sesame oil are all you need for the runny yolk to mingle happily with grains of rice. This may possibly be one of the first dishes I learned to cook. I don't eat much refined rice nowadays. My palate has actually grown to love the nutty chewy wild rice native to Ontario. Obviously the texture is completely different but I do like it for what it is. I used it today for a healthy update for one of my childhood favourites. I first rehydrate some shiitake mushrooms. 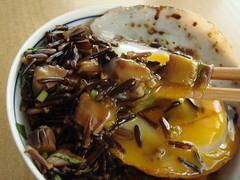 The broth was used to cook the wild rice along with diced mushrooms. My mom taught me that there are a few key ingredients in Chinese cooking to use as major flavour boosters. Dried shiitake mushroom is one of them. If I have conpoy at home, I would probably add them to the rice too. Once the rice is cooked, I drained away any excess liquid and tossed in some chopped cilantro. In a small frying pan, I cooked a duck egg sunny-side-up. Just as it was about ready, I drizzled in some soy sauce and roasted sesame oil. Just slide the egg over a bowl of rice and dinner is ready. Mix it all in! That's the way to do it. To thoroughly enjoy this comforting meal in all its glory, I must show you the very unphotogenic step-by-step pictures....of course. The golden runny egg yolk is a ready-made sauce that binds everything together in the bowl. It is important to stir and mix to your heart's content! Sure it's not pretty but definitely one of the most satisfying way to enjoy these duck eggs. Since I visited B in Virginia back in last September, I've been habouring a small obsession on duck eggs. You see, we went to the farm for his herd-share and I saw that occasionally they have duck eggs available for sale. 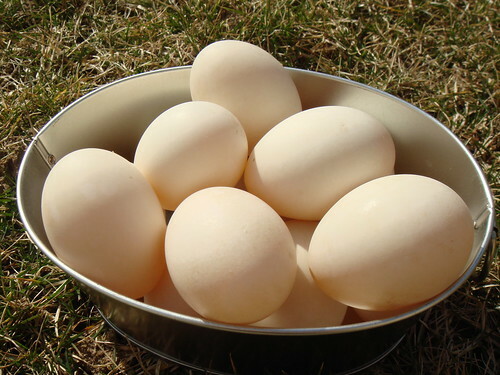 I know that duck eggs are prized for their incomparable flavour and some pastry recipes even specifically ask for duck eggs instead of chicken eggs for better taste. That trip made me realize my key to duck eggs lies in the hand of small local farms. Then winter came along and I still couldn't get those duck eggs out of mind. Shopping regularly at Greenbarn Market and getting farm-fresh free-range chicken eggs from my CSA only made me more determine to find them. My logic goes, if fresh chicken eggs already taste this amazing, then farm-fresh duck eggs must be out of this world! After months of obsessing, my wish has at last been granted. 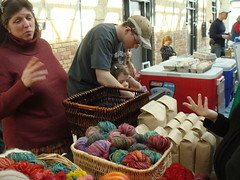 Stoddart Family Farm comes to Wychwood Greenbarn Market every last Saturday of the month. I signed up to be on their mailing list and last week, I received the news I've been waiting for. Since the oncoming of spring, the ducks start laying eggs again! I made arrangement to reserve a dozen for me immediately. Needless to say, I was smiling ear to ear when they handed me my long-awaited duck eggs this morning. It was not a hard decision coming up with ways to enjoy my first taste of duck eggs. Fried sunny-side-up, of course. I want to be able to discern the taste of the eggs without distraction. Once upon a time, I received a mini frying pan as a gift. I never used it because it seemed a little silly to me, especially with the egg figure handle. I do like my fried eggs perfectly round...perhaps the pan is not that silly after all. Well, removing the packaging material of the frying pan was unexpectedly messy. There is something ironic about an overly hardworking sticker that simply refused to part from the nonstick pan surface. I had to boil it off. Hmm. I cracked an egg into a small bowl and marvelled at the differences between duck and chicken eggs. The yolk is noticeably bigger and the white is perfectly clear. The way the shell cracked also felt different...a little softer and more pliable. As a testament to the egg's freshness, the yolk stands tall and firm. 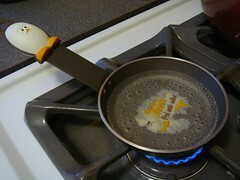 I heated up a small pat of butter in the hot frying pan and gently slid an egg into the pan. It sizzled and cooked up in no time. I sprinkled just the tiniest pinch of salt and a generous amount of freshly ground black pepper. It was everything I hoped for. The egg tasted so rich and so eggy, like something that a supermarket chicken egg can only dream to be. The best way that I can describe the taste is they take a few regular eggs and smoosh them into one. A concentrated essence of eggs. Of course it was still just an egg. But it was the best egg I've ever tasted. If only B can taste it too. When is a bite not just a bite? Ever since signing up for a share at a communicty shared agriculture program and shopping regularly at the Wychwood Green Barn Market, I am becoming more aware of the importance of supporting local farmers. I vote with my wallet and my tastebud and embrace the wonderful changes this has brought into my eating habits. However, every now and then, I make purchases that causes me to stop and wonder. I feel lucky to live in a region of the country blessed with temperate climate and rich soil. Aside from pantry staples, the majority of my produce, dairy, meat, and grain are grown within 100km of my home. There are a few glaring exceptions such as bananas. It's an athlete's best friend for a quick snack on the go. I don't plan on giving up bananas from my diet anytime soon. What made me think long and hard are the more frivolous impulse purchases. Take today for example. In this 24 hour period, I enjoyed mini red bananas from Colombia, kiwiberries and muscat grapes from Chile, strawberries from California. None of these are essential to my diet. All of these were purchased for no other reasons than to satisfy my tastebuds. How I enjoyed them though! 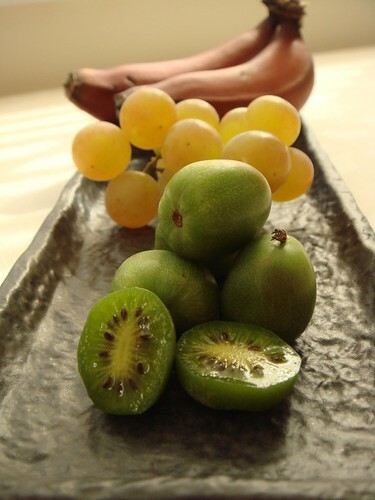 The creamy apple taste of the red bananas, the adorable cuteness of the kiwiberries, the honey floral flavour of the muscat grapes, and the fruity sweetness of juicy strawberries...all of them made me thankful for our modern food distribution system. I've fallen off the eat local bandwagon long and hard. But was I on the bandwagon to begin with? It bothers me that what we put in our mouths can be such a politically-, ethically-charged subject. I support our local farmers because the food is honestly tastier and fresher then their mass-produced counterparts. I enjoy the sense of community when I shop at farmer's markets and picking up my weekly share from my CSA. It is reassuring to know that my food is produced with sustainable farming practices. Beyond that though, I continue to see myself as someone who takes pleasure in eating. Great tasting food nourishes both body and soul. Whether it is an apple from my own backyard or jamon iberico from across the ocean, I want to enjoy them without guilt. This is a salad that contains so many of my favourite things it makes me wonder if I can like it any better. Actually, yes! It was something I thrown together intuitively, a complete Dessert By Candy original. I think I just like it a little more. When I received this week's CSA share, the tender mixed salad greens and heritage dried runner beans had my thoughts immediately turned to a bean salad. I found a handful of Bortolli beans leftover from the bean mole to add some varieties to the beans. I adore creamy starchy food so it's no wonder that kotobuki sweet potato is one of my favourite variety of sweet potatoes. At this point, this salad already promised to be a carb-fest. Citrus and sweet potato is a classic match. When I saw bags of kumquats and Meyer lemons at the store, I knew I found the right parters to brighten up the creamy beans and sweet potatoes. Toasted walnuts add crunch and richness while cilantro and shallots give it some bite. As for the dressing, that took a bit more thought. I love sesame and decided that tahini and roasted sesame oil can give this salad some middle eastern flare. However, creamy sesame dressing also had me thinking of Japanese vinaigrette so naturally I turn to sweet rice vinegar for the acidic component. The zest and juice of the Meyer lemon also went in. I've been dying to use my new tin of smoked sweet paprika so of course that made it to the dressing as well. Nestled over a bed of tender greens, this salad is great as a main course or better yet, a picnic. The balance of sweet and tart, creamy and crunchy is exactly how I like my salad. Spring is here at last! Nutritional information available here. Added bonus: this dish is gluten-free. If you replace the honey with pomegranate molasses, it is vegan too! 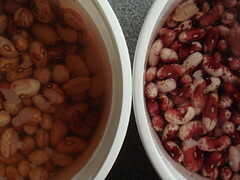 To cook beans: soak beans seperately overnight, covered with about an inch of water. Since the beans have different cooking times, I prefer to cook them seperately. For each pot of beans, cover with two inches of water, add 1 bay leaf, 1/2 sprig of rosemary, 2 sprigs of thyme, and 1 tsp of sea salt. Bring to boil and turn heat down to simmer for 30-45 minutes until beans are creamy and tender. Drain and set aside. You can cook the beans the day before and store in fridge. Preheat oven to 400F. Line a large baking sheet with foil. Toast walnuts for 6-7 minutes until fragrant, set aside in a bowl. Toss sweet potatoes dices with olive oil, season with salt. Put them on the baking sheet and roast for 30-45 minutes until tender and slightly golden. Set aside. To make dressing: in a small mixing bowl, whisk all the dressing ingredients until smooth. 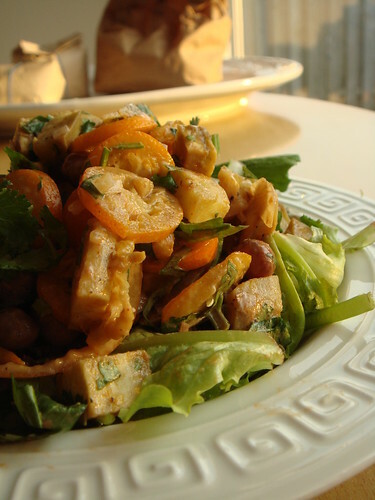 In a very large mixing bowl, toss together beans, sweet potatoes, kumquats, cilantro, shallots, walnuts, and dressing. Adjust seasoning with salt and pepper. 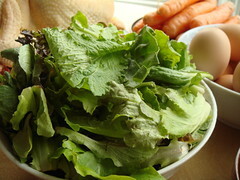 At this point, you can store the salad in a container in the fridge for up to 3 days. Or you can pack it in your cooler for picnic. To serve, line each plate with 1/2 cup of mixed salad greens. Top with ladles of bean salad. Serve immediately. Ever since I heard in cheesemaking workshop that whey is traditionally used to make borscht, I couldn't get that idea out of my head. As if all the stars aligned, last week's CSA share contains almost everything I need to make this hearty soup. 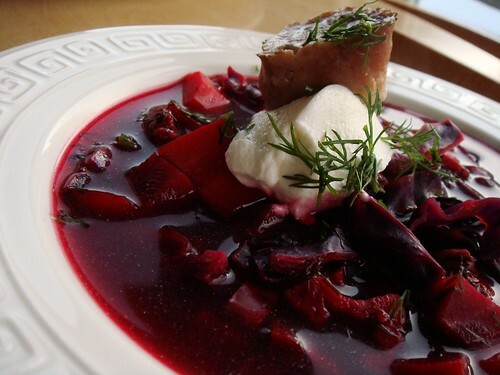 Needless to say, there are as many variation on borscht as there are grandmothers in this world. This is a nice simple version that I adapted from Simply Recipe. 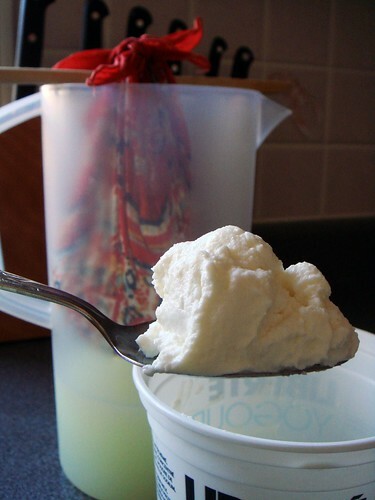 Yesterday I discussed how to make strained greek-style yogurt (scroll to bottom of the post). Whey is the by-product and this soup is a wonderful way not to let it go to waste. There are still plenty of nutrients in the whey and it adds a bit of tanginess to the soup. Of course you can substitute with more low sodium beef broth and adjust the seasoning accordingly. The idea of getting the last drop out of every ingredient appeals to the more frugal side of me. Speaking of frugal, I have to mention bone-in beef shank. This is a very cheap cut but perfect for this soup. The shank pieces are used to make a beef stock. The meat is chopped to add, well, meatiness to the soup. Even the bone marrows are not wasted as they make a delicious garnish! Talk about good to the last drop! Don't you just love the rainbow of colour? The night before, make the a basic beef broth. 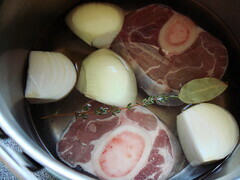 In a large pot, combine beef shank, water, bay leaf, thyme sprigs, onion, and carrot. Bring to boil and turn down heat to low. Simmer for 1 hour with the lid on. Cool to room temperature and strain. Store the broth in the fridge overnight. Seperate the fat and bone from the meat. Chop meat into 1.5cm cubes. Gently dislodge the marrow from the bone. Store meat and marrow in the fridge. You can discard the boiled onion and carrots or just eat them like I would do. The next day, when you take the broth out of the fridge, you should see a layer of solidified fat floating on top and the broth is somewhat jelly like. Using a fork, pick out the solidified fat and discard. You now have a defatted broth. Chop the beets, carrots, potatoes, and turnips into 1.5cm cubes. 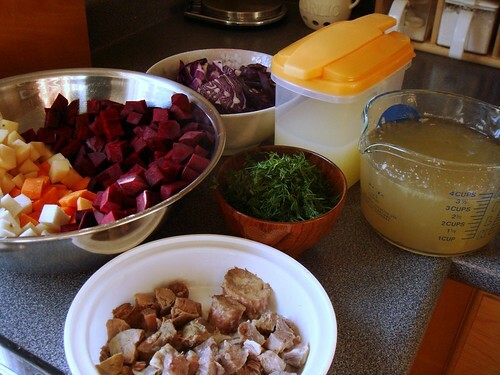 In a large pot, add together your homemade beef broth, whey, beets, carrots, potatoes, and turnips. Bring to boil. Turn the heat down and simmer for 30 minutes until vegetable is tender. Add in shredded cabbage, 1/2 cup of dill, and reserved meat. Cook for another 15 minutes until cabbage is soft. Season with red wine vinegar, salt, and pepper. To serve, ladle soup into soup dishes. Top with a dollop of yogurt or sour cream, sprinkle on some dill, and a piece of marrow. Carrot cake with cream cheese frosting...that's almost as American as apple pie. I've certainly made and ate my share of this classic dessert. Of course, as classic dessert goes, it is the furthest thing from healthy eating despite the misleading promise of carrots. Well, no more! 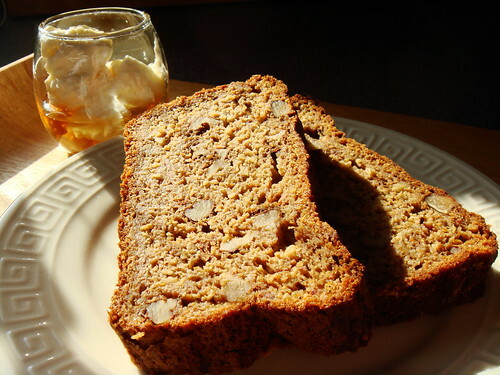 This carrot banana bread with maple yogurt frosting has the same flavour profile as you would expect from the traditional rendition but made much healthier in more ways than one. 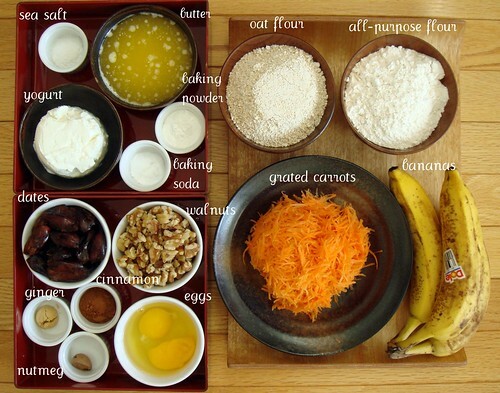 First, in lieu of sugar (refined or not), it is sweetened with grated carrots, mashed bananas, and dried date puree. For some whole grain goodness, old-fashioned rolled oats takes a trip to the food processor for transformation to oat flour. Cream cheese? Who needs cream cheese when you have strained greek-style yogurt thick enough to stand a spoon? Oh and who can resist maple syrup and walnuts to put this treat over the top? Yes, it is a treat. Close your eyes, take a bite, and go "Mmmm....". All that healthy mumble jumble? Just icing on the cake. Preheat oven to 350F. Grease and flour a 9x5x3 loaf pan, set aside. Toast walnuts in oven until fragrant, about 6-7 minutes. Set aside to cool. 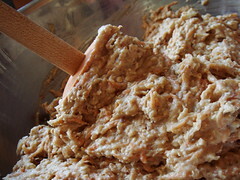 In a food processor, whirl the rolled oats until finely grind. Pour into a large mixing bowl. Whisk in the remaining dry ingredients including all-purpose flour, baking powder, baking soda, salt, cinnamon, ginger, and nutmeg. If you have not grated your carrots, you can use your food processor to grate them now and empty into another bowl. Puree the bananas in the food processor and measure out 1 1/4 cup. Add the honey dates into the food processor along with the bananas and process until smooth. Empty the fruit puree into a mixing bowl and whisk in yogurt. Stir until incorporated. Add eggs and stir until incorporated. Stir in melted butter too. Lastly, stir in grated carrots. Pour the wet ingredients into dry ingredients. Using a rubber spatula or wooden spoon, gentle fold the ingredients until just combined. Do not overwork the batter! Fold in walnuts. Pour into prepared baking pan and bake for 60-75 minutes until cake tester comes out clean. Cool in pan for about 20 minutes before unmolding. The cake can be quite fragile so be careful with it. Cool on wire rack right side up and cut into slices only when it is completely cooled. 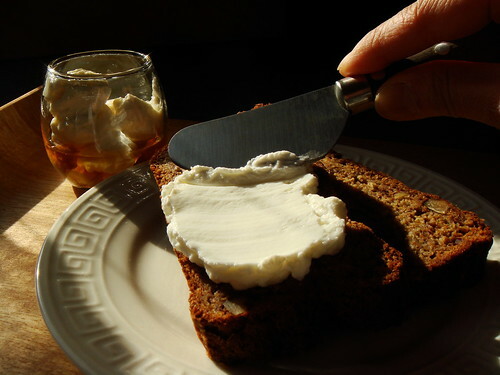 Serve with a generous spread of maple yogurt frosting. Don't be shy! For those who are lucky enough to have easy access to strained greek-style yogurt, I envy you. (Hello Fage!) Boohoo to me, I need to drive at least 30 minutes and pay premium price at a gourmet grocer to get mine. Great selection and a lovely place to shop, mind you. But fair to say it is not the most convenient errand. After partaking the cheesemaking workshop at The Stop, I finally got my act together and made my own strained yogurt at home. It is the easiest thing ever. Makes me wonder why I did not do this sooner. Set a clean lint-free handkerchief over a mesh strainer on top of a mixing bowl. Empty a tub of non-fat regular yogurt into the handkerchief and knot the corners into a little bundle. Slide a wooden spoon under the knot and balance the whole parcel over a jug to catch the whey. Leave it in the refridgerator overnight (I prefer 24 hours) and you'll have thick creamy strained greek-style yogurt the next morning! Store the yogurt in a clean plastic container and you're all set. I like to use it in place of creme fraiche, sour cream, or cream cheese. Shhh, nobody needs to know it is non-fat and high in protein! As for the whey, don't pour it down the drain. 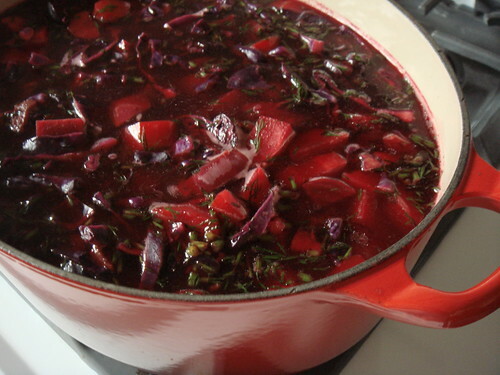 It is great for making borscht which I'll write about in the next post. This is really the easiest frosting ever. 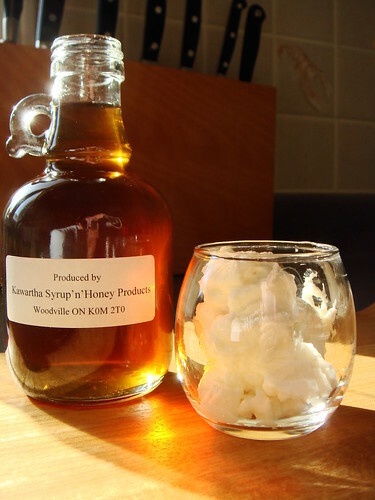 The key lies in using really well-strained yogurt that is thick enough to take in some maple syrup without turning too thin. 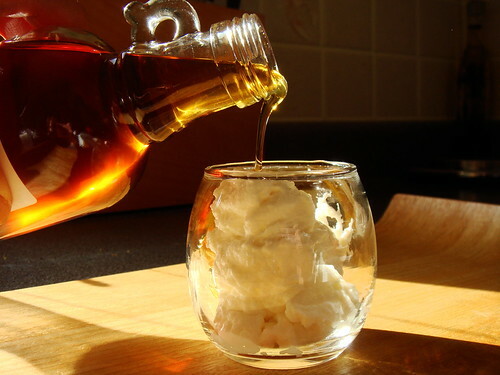 Basically, take a dollop of strained greek-style yogurt, pour on some maple syrup to taste, stir together, and spread away! Of course, you can eat it as is too...I wouldn't tell anyone. With the beautiful bag of borlotti beans that I bought from Highmark Farm and the cheery orange kabocha from Healthy Butcher, I could have easily make something simple. My typical style of cooking is far from heavily spiced nor particularly complex flavour. This luscious mole is so far removed from my comfort zone that I was instantly intrigued when I saw the recipe from 101 Cookbooks. I made some minor adaptation to the recipes to add my personal touch. The chocolate that I used was Ghirardelli Intense Dark Espresso Escape at 60% cacao content and a piece of Lindt Excellence 85% to balance out the sweetness. Coffee adds instant depth to chocolate flavour but I also threw in a couple teaspoons of cocoa powder for good measure. Mole....mexican....chocolate....cinnamon seems to be the next logical addition, no? I used only one jalapeno but seeing that it did not add enough heat, I minced two chipotle in adobo and mixed it in along with the tomatoes just for a hint of smokiness. I am impressed with the depth of flavour of this easy mole. Caramelizing the onions and jalapeno draws out so much flavour. It was layered with sweetness from roasted kabocha, chocolate, roasted almond, tomatoes, and cinnamon. Spiciness was a mixture between jalapeno, chipotle in adobo, and paprika. Everything was tied together by the creaminess of perfectly cooked beans and squash. Who would have thought a vegan dish can be so satisfying? The night before, rinse dry beans and soak in water overnight. In a medium saucepan, simmer soaked beans in water with 1 tsp of kosher salt for about 45 minutes if the beans are fresh. You want the beans to be just slightly undercooked. Drain the beans and reserve cooking liquid. While the beans are cooking, toast the ground almond in the oven for about 4-5 minutes until fragrant and golden. Pour into a dish to cool. Toss kabocha squash with olive oil on the baking sheet. Roast for about 20-30 minutes in the oven until brown. Set aside to cool. Turn oven temperature down to 250F. In a 5qt dutch oven, heat 1 tbsp of olive in medium high heat. Add in diced onions and jalapeno and turn the heat down to medium low. Stirring only occasionally, caramelize the onions and jalapeno until nice and brown, about 30 minutes. Stir in garlic and cook for about 3 minutes until garlic smells really good. Add in tomatoes, chipotle, paprika, cocoa powder, cinnamon, ground almond and simmer for about 15 minutes. Stir in chocolate pieces until melted. Season with kosher salt. Add kale to the sauce. 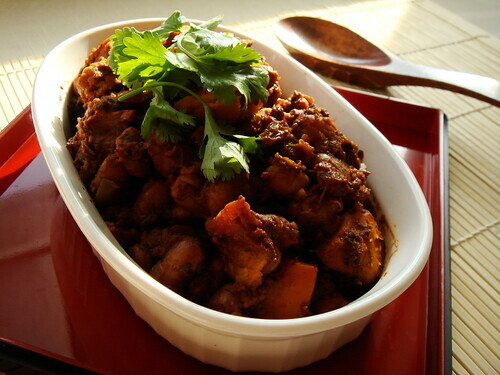 Mix in drained beans and roasted squash cubes. Toss very gently until sauce is evenly distributed. If it is too dry, use some of the reserved bean cooking liquid to thin the sauce. Cover the dutch oven with lid and bake for 2 hours until beans are creamy in the centre. A note as to why I used Ghirardelli Intense Dark Espresso Escape: when I went to Virginia in February, I insisted to B that we go to TJ Mexx to scoop up deals on post-Valentine chocolate sale. Well, they didn't have any. But being TJ Mexx, they had something even better: one whole bag of this coffee-laced chocolate for a buck! I got caught up in the thrill of finding a deal and bought some. I haven't eaten any since I returned home because I'm not a huge fan for Ghirardelli chocolate. Using them up in a mole is a good idea instead of dipping into my stash of good chocolate.